If you are lucky enough to live in the Portland, Oregon area, or happen to have an Internet connection (which I suspect you might if you’re reading this) then you had the opportunity on Thursday May, 6th, 2010 to tune into the Paula’s Picks program on KBOO FM during her program and hear her present “You Have To Be There” performed by Helen Sjöholm from the musical “Kristina.” “You Have To Be There” is written by Björn Ulvaeus and Benny Andersson of ABBA. Paula Small is a friend of mine that I went to high school with and she moved to Portland and one of the fun things she does out there is host a radio program on the first and third Thursdays of every month for KBOO. The last time I saw Paula was when she was back in town to visit some family at the end of 2008, so I took Paula to see the Xanadu production at the La Jolla Playhouse, and when I saw her online on Facebook and I said hello using the chat feature of Facebook, we ended up discussing some music. I was so excited about the live album “Kristina At Carnegie Hall” coming out and I’d just gotten it in, I sent her “You Have To Be There” to share my excitement about the show. Paula really liked the song and we both commented about how it starts out similar to “Don’t Cry For Me Argentina” but ends up being a much more powerful song. Paula thought it might make a great addition to her show the following night. So I scrambled to put together an announcement email for my ABBA friends to invite them to tune into the broadcast. While I suspect a number of them already have the Kristina album, it’s a fun excuse to tune into a show to hear it played on the radio, no matter where in the world you are. In case you missed the broadcast, you can listen to Paula’s introduction of the song and her comment after the song by clicking here (Note: Song was edited out so not to violate copyright restrictions). If you want to hear the song, you can play samples of it (or buy it) from Amazon or iTunes by clicking on the respective online store name. And you can also e-mail Paula’s radio program and ask her to play it again and tune in when she plays it. 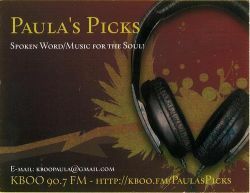 Information about Paula’s Picks program and how to reach Paula can be found on her show webpage by clicking here. KBOO is a community sponsored radio station, that is member supported (similar to PBS television stations) and as such they often have to do community pledge drives. Every little bit helps keep programs like Paula’s Picks on the air. Check out her show the first and third Thursdays of every month between 8 pm and 10 pm Pacific time. Consult Timeanddate.com to figure out what time her broadcasts are in your time zone. You can tune in to her show in the Portland area at 90.7 FM, or listen online with the help of the KBOO FM listening guide by clicking here. And Apple iPhone and iPod Touch users can download the Public Radio Tuner application from the iTunes App Store by clicking here and find KBOO FM on the app to listen remotely. Be sure to tune in and tell Paula that Ryan sent you. Thank you for finding my blog and contributing a compliment about Paula. She is a wonderful person and I am jealous that you get to be a colleague of Paula’s. It sounds like you guys have an awesome and eclectic range of styles presented on your radio station. That truly embodies the community spirit. yep, Paula is real cool!